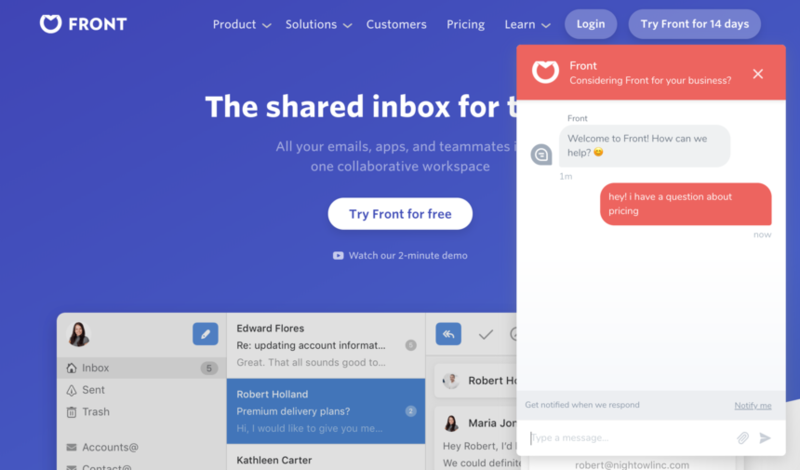 Front Chat is the simplest way for teams to manage live chat in Front. 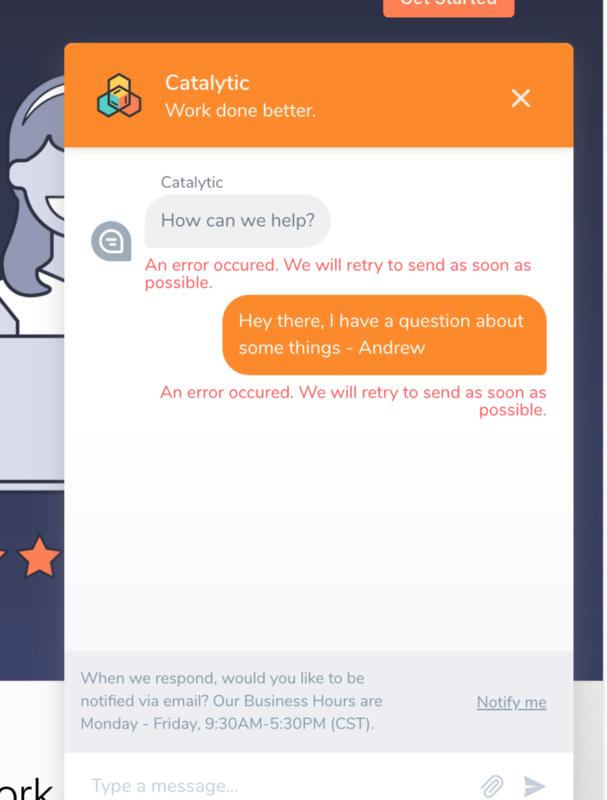 With the Front Chat application installed on your website, messages from your site visitors appear instantly in Front for follow up from your team. 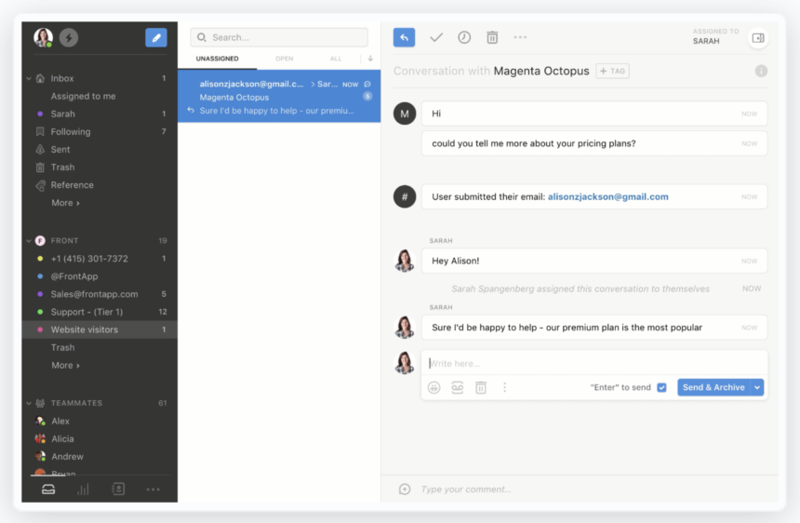 Our Plus and Pro pricing plans include Front Chat, so all teammates with access to the inbox can chat with customers! Front Chat also allows you to customize your branding with a custom color, logo, and header greeting. You can also set an automated welcome message to be pushed to every site visitor and enable email capture with a custom prompt. Below is a screen shot of each setting. You can edit these at any time in Settings > Team > Inboxes > [Your Chat Channel]. Front Chat will be always be visible on your website by default. 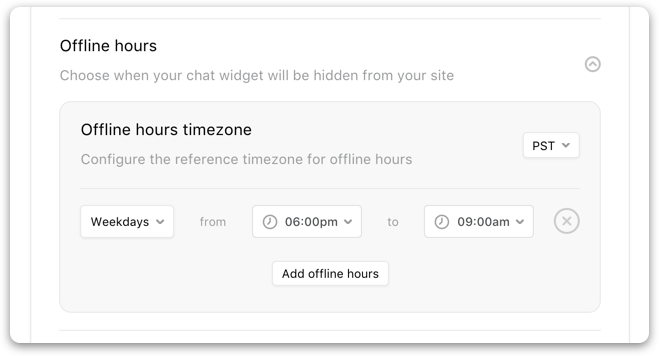 If you'd like to hide your chat application when your team isn't available (such as at night), set your Offline Hours in your Front Chat channel settings. 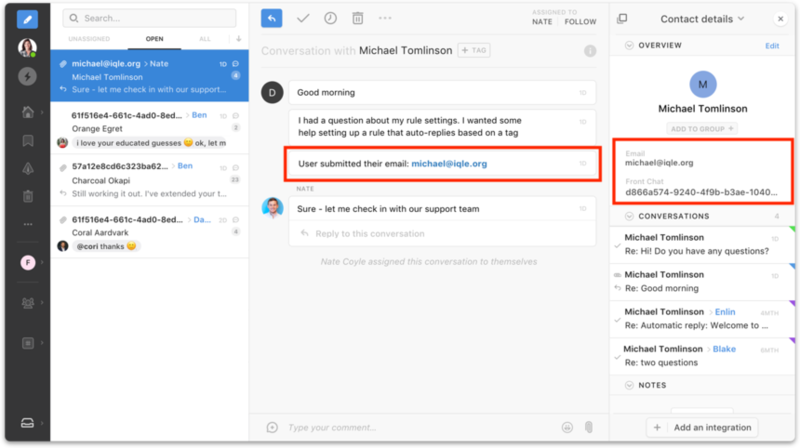 10 seconds after a chat is initiated, Front will prompt anonymous user to enter their email address to be notified of a response. You can disable this option or customize your prompt in your channel settings. 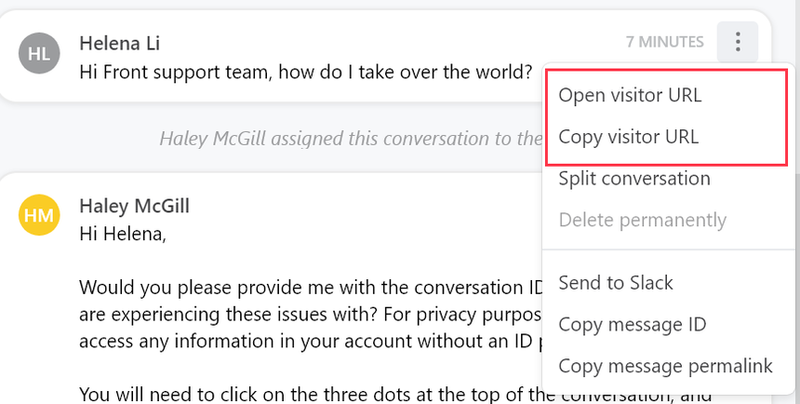 If you are using Front Chat in a web or desktop application and need to identify logged in users, after adding the code snippet you will need to complete an additional step in your set up. You can install your custom chat application on as many pages on a single website as you like. 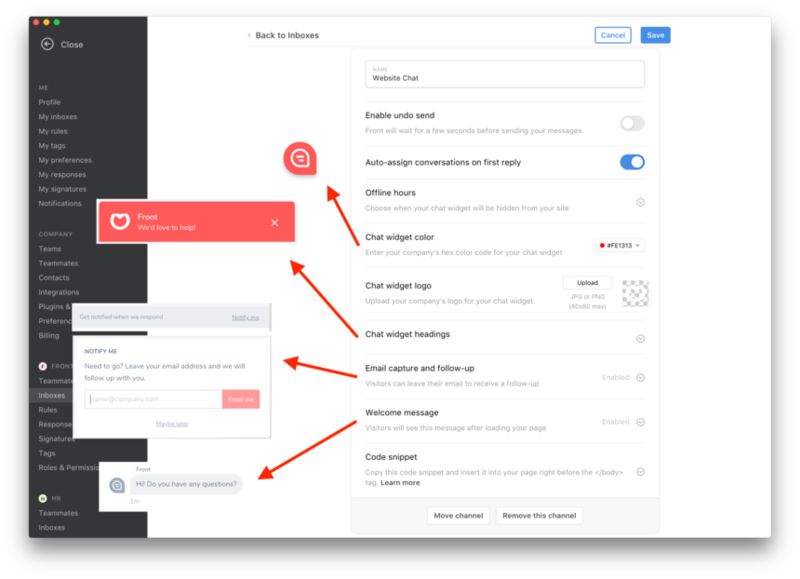 All messages will flow into a single chat inbox, and the conversation will be persistent for the customer across your entire site. 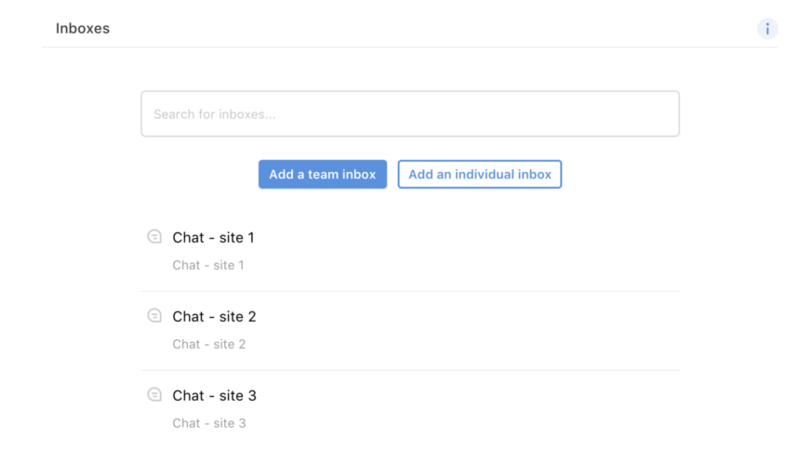 If you are managing multiple websites, you can handle chat conversations separately for each site by creating a separate chat channel for each site. Customize each application to match each site's branding, install the appropriate scripts, and the chat conversations for each website can be handled in separate inboxes in Front. To edit your Chat licenses, go into your Billing settings and click Manage users underneath the Chat add-on. Once you set up a Front Chat channel, your team can chat with your website visitors in real-time directly from Front. 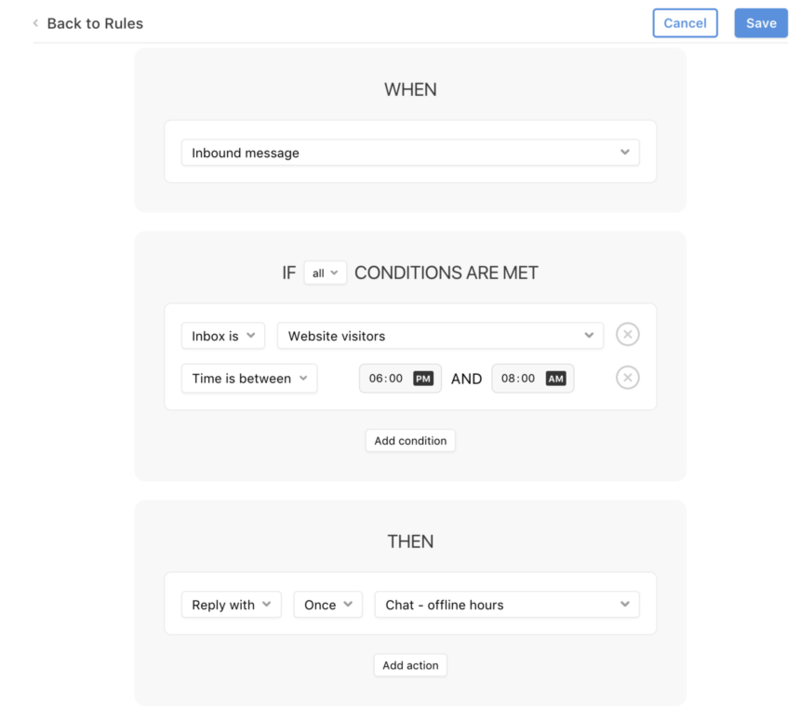 Use the same rules, analytics, tags, and workflows for Chat that you use for your other channels (email, SMS, Twitter, etc) in Front. If the user is logged in and verified or enters their email in the email capture form, Front will search for that email address in your contacts. You can tell if a visitor has submitted their email if this message appears: "User submitted their email: me@company.com". If the email address doesn't match an existing contact, a new contact will be created in Front. If the address matches an existing contact, the chat message will be linked to that contact's details. You can view all of their past conversations by choosing Contact Details in your integrations panel. If you have any integrations enabled that use an email address to identify records, those details will be displayed on the conversation as well. This applies to Front's CRM integrations: Salesforce, Pipedrive, Base, HubSpot, and Zoho. If a site visitor does not enter their email address in the "Notify Me" prompt, the visitor will be anonymous unless you are using identity verification to pass user names and email addresses. 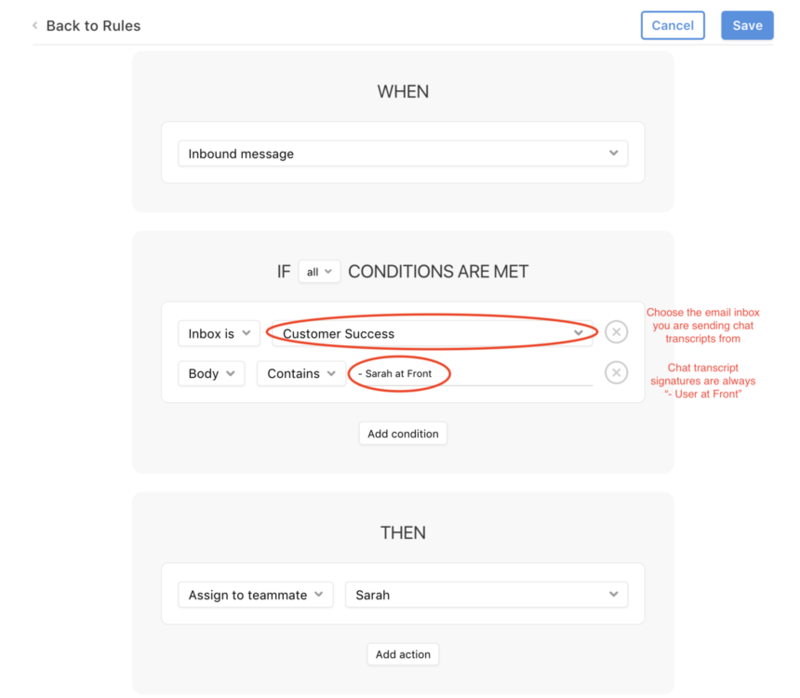 When a visitor enters their email address in the "Notify Me" flow, Front can easily transition the conversation to email if they leave your site without following up. You can choose the email address your transcripts are sent from in your channel settings using the dropdown menu under Email capture. It must be sent from a team email channel that you have connected to Front. 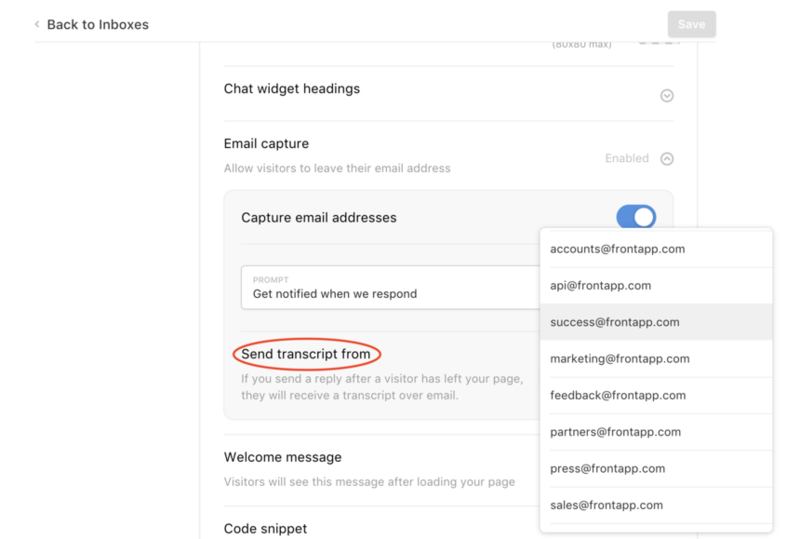 When a site visitor replies to the email transcript, the message will arrive in your chosen shared email inbox in Front. It will not be assigned to anyone, but you can use rules to assign conversations automatically (see below). Rules and Analytics are available for customers on Front Premium or Front Enterprise plans. 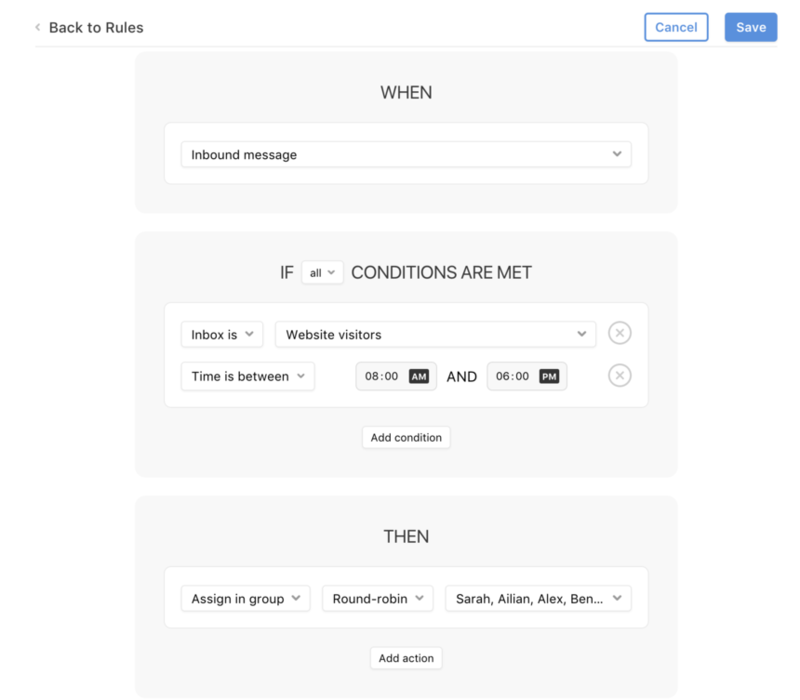 You can use rules and run analytics reports for your Front Chat channel the same way you use them for email, SMS, or other channels in Front. Understand where your customer is on your website. Click the three dots on the right side of any message to Open visitor URL or Copy visitor URL. We have been using Front Chat with no issues but as of today we started to run into the issue that's showing up in the attached screenshot. Can anyone comment on how to rectify? We've validated that the snippet is setup correctly and have made no other changes to our setup. Thanks! (2) When users are *not* identified, they're being assigned random, funny names. This is fine on the surface, but is becoming problematic when I start to use my bank of responses. For example... I just used a response that uses the name customization field, and if I hadn't caught it, I would have called my customer "Tangerine Rhinoceros" because that's what her "name" was, according to the chat. Advice? 1. Currently there's no way to require email, but we hope to make this improvement in the future. 2. At this time, there's no workaround here either. I'd suggest not personalizing the canned response, or using 'Hi there'. Cori Morris Many thanks! May I please register an *extreme* request for the mandatory email address. We are transferring from another chat system that had that feature, and I really miss it. Thank you!! We have a situation where a lot of our users are already signed into our system before starting front chat. We want to be able to provide their IDs to front chat so they don't need to enter their emails again. 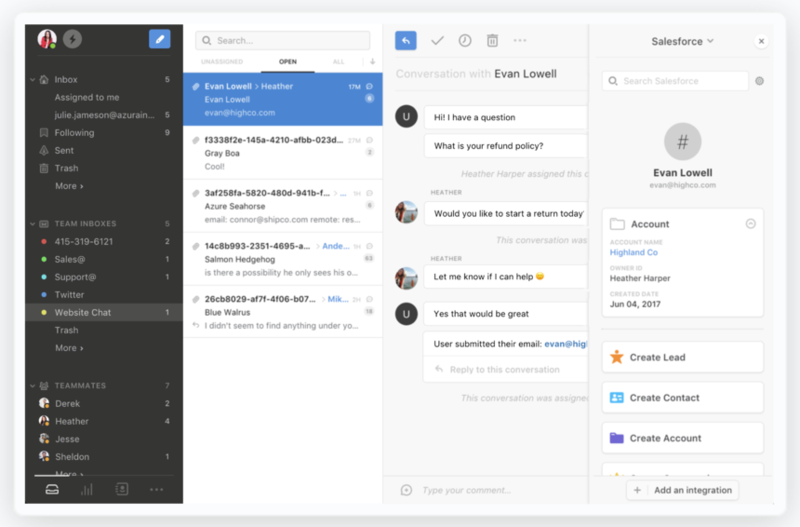 Is there a way to associate our users with front chat conversations without having to ask them for emails? If not, is there any plan to implement that? Hey Cori Morris When is authenticated chat coming? Right now it's 100% worthless for anything private since you can type in anyone's email address. I need to be able to pass in the user's email along with a signature that Front can verify that my app signed it to be clear the user is who they say they are. We will be adding this feature in the future. I don't have an exact timeline for it yet, but will let you know when it happens! Eric Hurkman great news! we just released this feature. Be on the look for an email for more info thanks for your patience. Hi there. We really need inline image support (from saved responses), and bulleted lists (from saved responses) to really commit to using Front Chat. We'd really like to switch to you guys from Intercom, but not having those features is a dealbreaker. Hi there, is there a way now to ask users to submit their email or name as the first step? Hi Luis Eduardo Vilella, the chat currently offers to get their email, but it isn't required. We have a feature request open for this, so we'll let you know if it does get incorporated into an update!